Solarscope Ltd. Products Brochure 2012. This is the complete four page color illustrated document outlining the Solarscope SF and DSF solar filters and the SV series solar telescopes. This is provided as an Adobe .pdf file (2,835,473 bytes). Publication content copyright 2012 by Solarscope Ltd.
Solarscope Ltd. DSF-100 Addendum By Company Seven. This is the complete eight page color illustrated document Company Seven provided by solely to those who have acquired this equipment from us. This expands upon the instructions provided by the factory and explains the components provided with the SF-100/DSF-100 filter systems, set up, operation, components specifications, care and maintenance, and guarantee. Document provided as an Adobe .pdf file (4,466,724 bytes). Publication content copyright 2012-2013 by Company Seven. Download Link provided to our customers only by E-Mail request. Solarscope Ltd. DSF-70 Addendum By Company Seven. This is the complete eight page color illustrated document Company Seven provided by solely to those who have acquired this equipment from us. This expands upon the instructions provided by the factory and explains the components provided with the SF-70/DSF-70 filter systems, set up, operation, components specifications, care and maintenance, and guarantee. Document provided as an Adobe .pdf file (4,543,882 bytes). Publication content copyright 2012-2013 by Company Seven. Download Link provided to our customers only by E-Mail request. 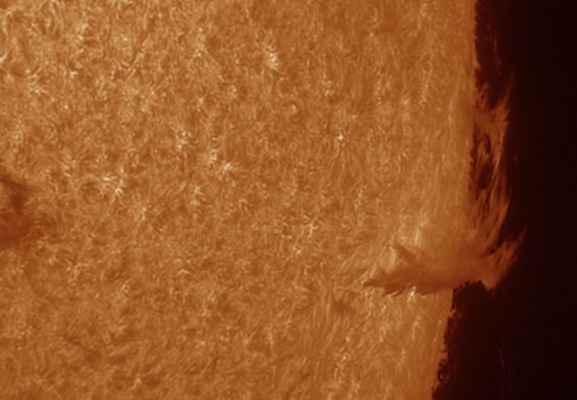 Above Right: Another stunning and informative single exposure processed to reveal a Filament near the limb of the Suns disc demonstrating how these transition to a Prominence, appearing to project off the edge of the Sun. Click on image to see enlarged view (79,019 byes).